Today the PS Utilities Chrome Extension has been updated to version 3.0.0. This latest release fixes a few minor bugs, updates the extension to better handle PeopleTools 8.54 (especially Fluid pages) and has one fabulous new feature: One-click to turn on PeopleCode and SQL Tracing! How clunky is it to turn on and off tracing from within PIA? How many mouse clicks does it take to get to the Trace PeopleCode and Trace SQL components, choose your options and save each component? This new feature in PS Utilities hides all those mouse clicks. All you need is one click to turn on tracing and another click to turn it off. There are 2 simple steps you need to perform to to get it working for you. You first need to enable the Tracing feature on the Features tab of the PS Utilities Options page. 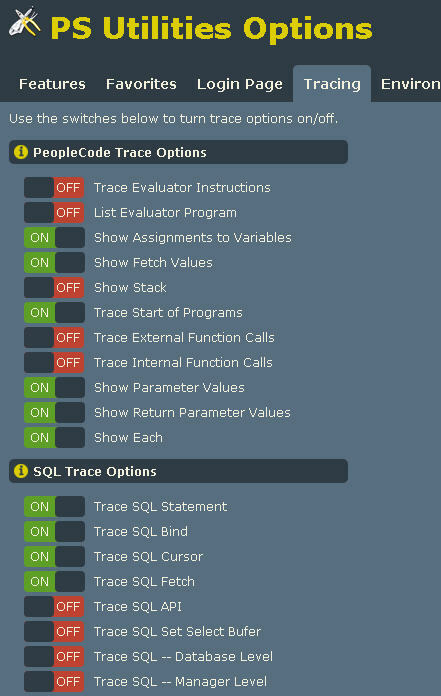 And you then need to perform a one time setup of PeopleCode and SQL Trace options under the new Tracing tab on the Options page. Here's a screen shot with my favourite Trace options selected. 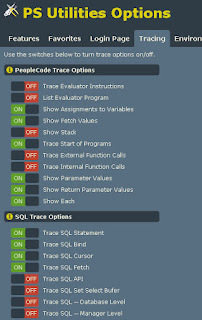 Notice that these options match the options you see if you go to PeopleTools > Utilities > Debug > Trace PeopleCode and PeopleTools > Utilities > Debug > Trace SQL. Then on the PS Utilities Bar you need to press the icon to turn on tracing. And press the icon to turn off tracing. It's as simple as that. You will see the icon rotating when you login to PeopleSoft or if you navigate to some pages. It does this while it determines if your user ID has permissions to access the PeopleCode and SQL Trace components. If your user ID does not have permission to either of these components then you will see the icon and you will be unable to turn on tracing. If you want to turn on tracing for just a short period of time to trace some specific functionality (such as the click of a button or the save of a page), this new Trace feature of PS Utilities will make that so much easier. Try it out. And if you have any feedback it would be greatly appreciated. You can leave a comment here on this blog post or you can submit a support request directly on the Chrome Store page for the extension. This looks brilliant. So simple to use and just get a trace file of the code I need to look at rather than ever line since logging in is going to be very helpful.